Sarah Godfrey, CPA joined UMMC in 2012. She came to us with a strong bookkeeping and auditing background. She graduated from George Mason University in 2011 with a Bachelor of Science Degree in Accounting and a minor in Legal Studies. 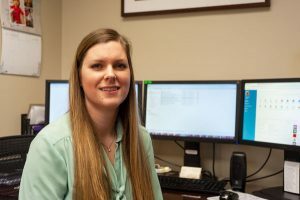 She has been a valued team member of our Warrenton office serving UMMC clients in tax preparation and planning, as well as bookkeeping and outsourced CFO services. Sarah is currently a member of both the American Institute of Certified Public Accountants (AICPA) and the Virginia Society of Certified Public Accountants (VSCPA). Also she serves on the Board for Foothills Housing Corporation as Treasurer. Sarah lives with her husband and daughter in Warrenton, Virginia. She enjoys spending time with family, playing with her dog, and working on projects around the house and garden.